With the FIFA World Cup and other assorted geopolitical issues this summer, Russia's been in the news a lot lately. When we think of beverages and Russia, the mind immediately skips to vodka so we're taking the opportunity to do a Vodka State of the Union. Our conclusion is simple: vodka as a category is healthy, but with the growing relevance of craft and new exciting value entries, the dominant big players and their mega-brands have serious challenges ahead. Across alcoholic beverages, the craft model of 'local and authentic' has completely rewritten the rules. As a result, leaders Diageo and Pernod Ricard have serious challenges ahead while Tito's, the flagship of craft vodka, and New Amsterdam, an affordable and eclectic brand backed by the Gallo distribution network, look unstoppable, at least for now. With limited barriers to entry and an inexhaustible consumer demand for variety, we believe the avalanche of small specialty brands entering the market will keep pressure on the big international mega-brands, as has happened in beer especially. The good news is that vodka remains healthy on volume growth and share of throat within distilled spirits. Per our proprietary DrinkTell database, Beverage Marketing Corp finds vodka remains at the top of distilled spirits world with just under 32% of category consumption. That share percentage is down less than 1% from 2011, having withstood the decade-long rally from American and Irish Whiskies. From a consumption standpoint, volume looks good. From 2011 to 2017, the category rose in volume from 64.2 million cases to 71.4 million cases at a CAGR of +1.8%, just under the +2% industry growth rate. Per capita consumption rose as well, from 0.49 gallons to 0.52 gallons a CAGR of 1%. Vodka is not going away any time soon. For the big players, the rise of craft spirits was probably inevitable. From the 1980s to the early 2000s, there was nothing sexier in beverage alcohol than vodka. Diageo's Smirnoff dominated the category, backed by strong branding, deep distribution, affordability and consumer perceived high quality liquid. In super-premium, Pernod Ricard's Absolut reinvented how spirits were marketed with a terrific and iconic print campaign, one which remains a gold standard for brand marketing today, and the first to launch flavors in Vodka. Brands like Grey Goose, Ketel One, Ciroc and Skyy, all with high-end imagery and perceived great liquid, brilliant packaging and attractive bar calls, created genuinely interesting high-end options when consumers wanted to trade up from the two heavyweight market leaders. But while the big vodka mega brands were on fire, over in beer the 'local' and 'authentic' craft beer model was booming, eventually reaching critical mass in the 2000s and putting enormous pressure on big brewers. But as craft beer kept accumulating successes, not only did the consumer's expectations for beer change, but the consumer's expectations across allof beverages changed. Consumer demand for local, authentic or cool at an affordable price kept growing with no end in sight and craft spirits were all but inevitable. Enter craft and new value vodkas. Vodka turned its sights on the craft model and soon the rapid rise of Tito's (launched commercially in 1997) marched on in parallel to the affordable but hip value play New Amsterdam (2011). This turned the industry on its head. With eclectic packaging and new product claims ('handmade'?) and competitive pricing, both Tito's and New Amsterdam sent Diageo and Pernod Ricard spinning into market share declines of which neither has truly recovered. Tito's benefits from a 'craft at mainstream' pricing positioning while New Amsterdamcombines affordability and hipness. Since 2011, the market share shift from big brands to craft and new hip value brands within vodka has been extraordinary. While Smirnoff still remains the leader, market share has sunk from 15.0% in 2011 to 13.6% in 2017. In parallel, Absolut, which was the number two vodka in 2011 at 7.1% share, lost nearly 2% to land at 5.3% share in 2017. This landed Absolut at the number four spot behind Tito's and Svedka, a successful mainstream priced import entry from Constellation Brands which also picked up nearly one share point. Collectively, Smirnoff and Absolut lost more than 3% share of vodka during that period. In comparison, craft and hip value brands dominated growth. Tito's rose from 0.9% market share to 7.4%, an increase of 6.5%, Svedka from 5.8% to 6.6%, a 0.8% increase, and New Amsterdam rose from 0.5% to 3.9%, a market share increase of 3.4%. This aggregates to nearly 11% share in six years gained by the three leading craft/hip price/value vodka brands. When we dive into our DrinkTell numbers, it's not just the market leaders losing share, it's the long tail of everything not Tito's, New Amsterdam or Svedka. Of the 42 vodka brands big enough to track in our data, 70% lost share from 2011-2017. So what do we see in the future? 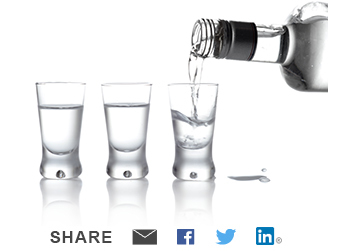 We see the vodka category maintaining its health, growing to a case volume of 77.9 million by 2022 at a CAGR of +1.8%. As for brands, it's always difficult to judge where individual trademarks will be in five years, but we do see Tito's, New Amsterdam and Svedkacontinuing to put pressure on Smirnoff and Absolut. Even if Tito's and New Amsterdamdo slow, we think the market is primed for new craft brands to pick up the slack — Diageo and Pernod Ricard certainly need to build that into their future plans.